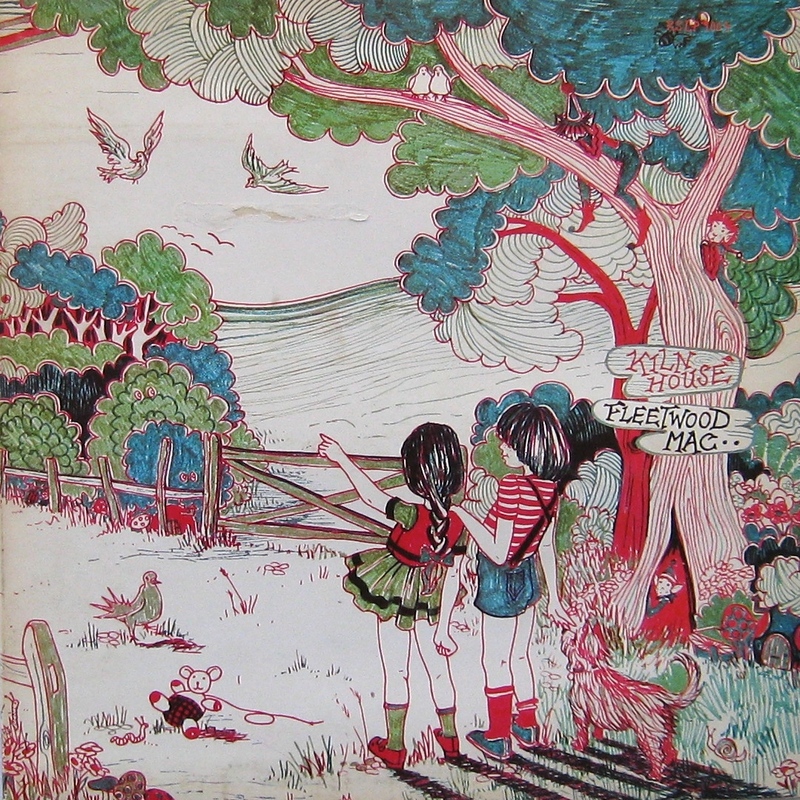 With the recent passing of guitarist Danny Kirwan, I’m re-posting an edited version of a survey of the early 70s Fleetwood Mac albums, including—indeed, highlighting—those that feature Mr Kirwan. By the beginning of the 70s, Green had left Fleetwood Mac. This was widely considered a damn shame, as the mercurial guitarist was the central instrumental figure of the band. 1970 saw the release of the patchy and transitional Kiln House. It was guitarist Danny Kirwan’s second album and almost Christine Perfect’s first: she sang backing vocals and drew the cover but only became a card-carrying member after the album was completed. Other guitarist Jeremy Spencer dominates proceedings with his rock ‘n’ roll pastiche – not an especially edifying nor enjoyable experience. But Danny Kirwan’s contributions are thoughtful and engaging; he was warming up nicely, his understated playing and almost diffident singing a refreshing contrast to the uninspired throw-back material. Next came my favourite of this period and without doubt one of my Top 3 Mac albums: Future Games. Released in September 1971, it was the first to feature songs by Christine McVie and new member Bob Welch. Their contributions are enjoyable, particularly Welch’s drifting, shimmering title track, but it’s Kirwan’s songs that I never tire of. His “Woman of a Thousand Years” opens side one while “Sands of Time” serves the same role on side two. Both are infused with a melancholy beauty that transcends time just as their titles suggest. 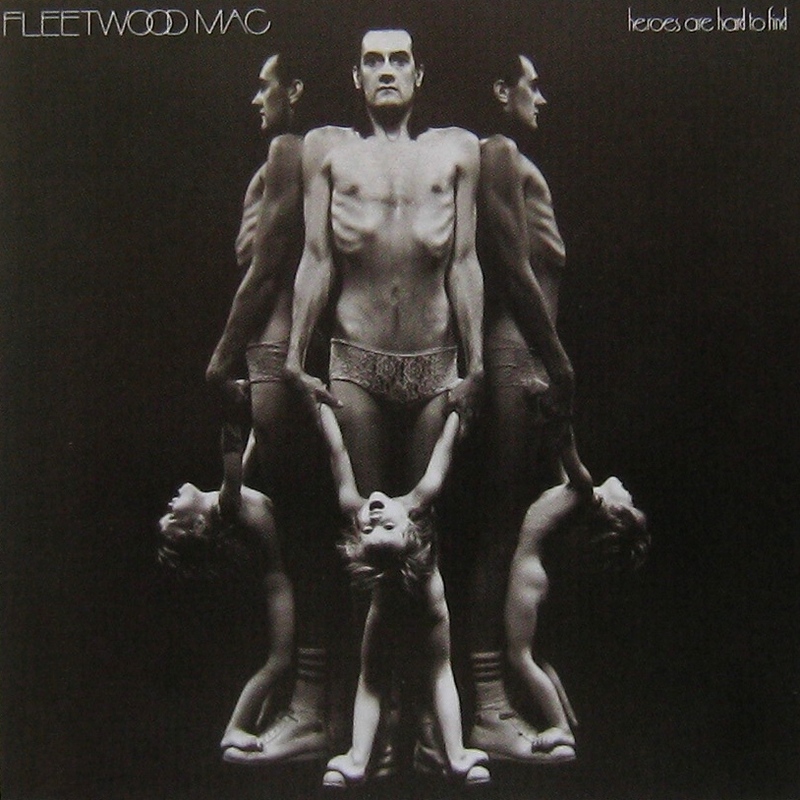 This was the first Fleetwood Mac album to achieve ‘Gold’ status in the US, yet is rarely mentioned these days. It holds up very well indeed and would, I’m confident, be enjoyed by fans of the ’75 self-titled Buckingham-Nicks Fleetwood Mac debut. Favourite song: The whole album. 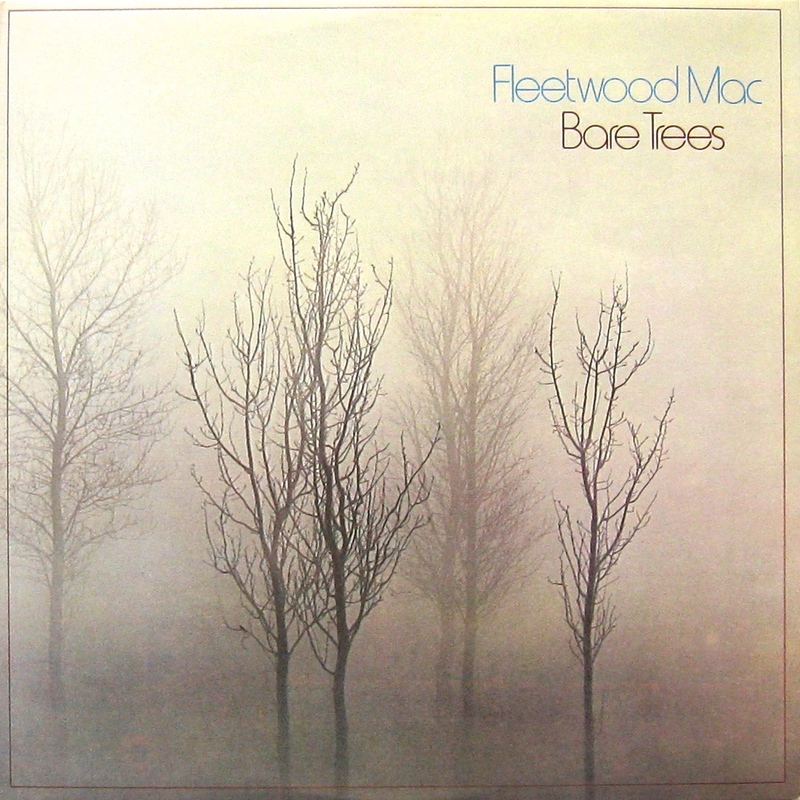 Bare Trees was the sixth studio album. It is Danny Kirwan’s last appearance; he was sacked during the subsequent tour. Quite a shame, as his five songs are again a highlight. 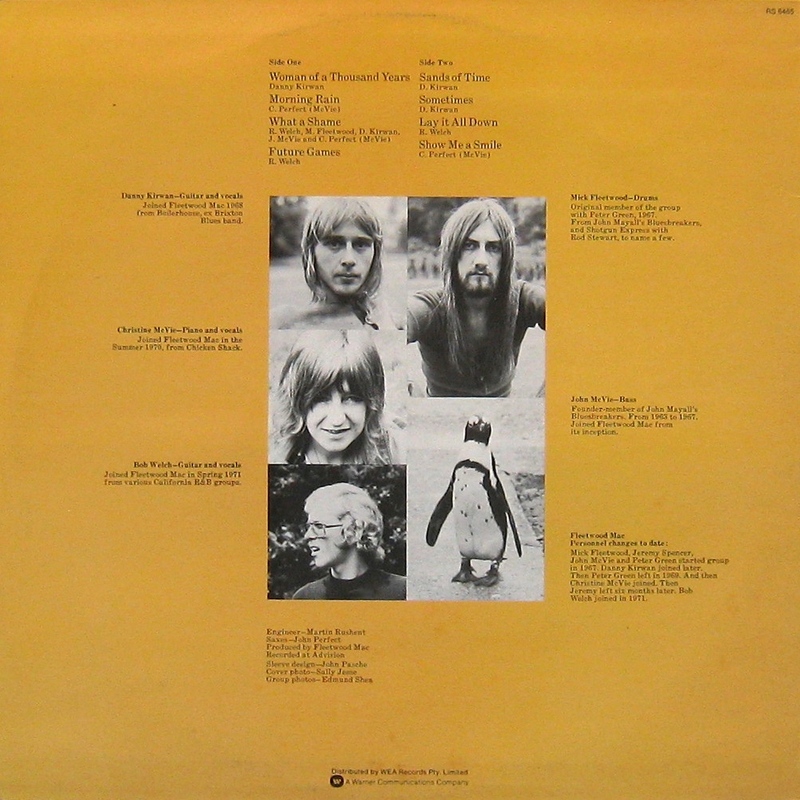 The other half of the album’s song-writing credits are shared between McVie and Welch. They contribute two songs each and all are solid and enjoyable. And isn’t it a wonderful winter cover? Favourite song: “Bare Trees” (D. Kirwan), though Christine McVie’s “Spare me a little of your love” is one of her strongest and comes a close second. 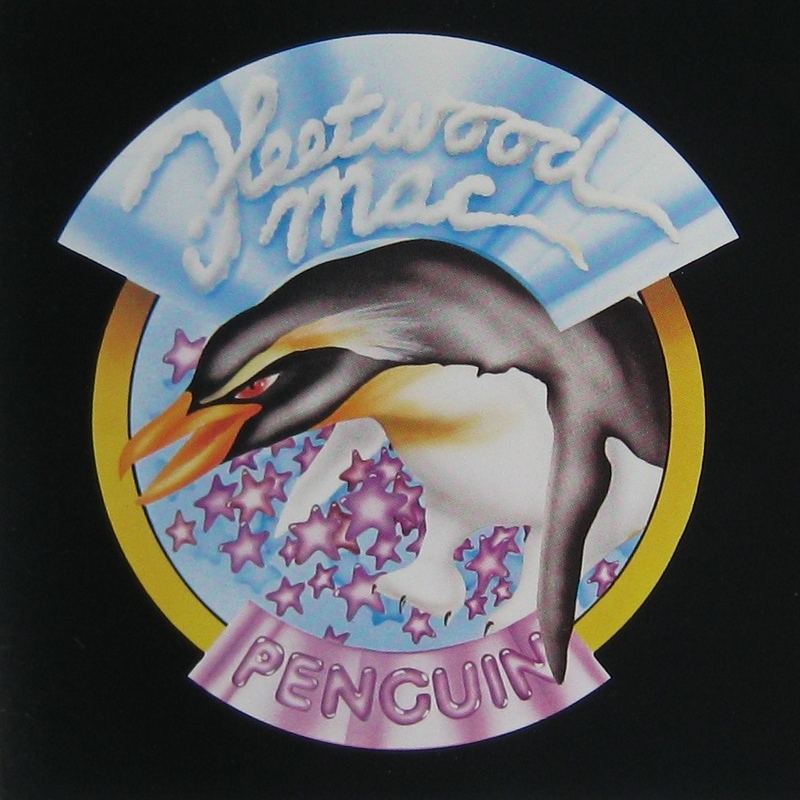 Apparently John McVie had a thing about penguins (see Future Games cover). The little swimming bird-chappies provide the title of the 7th album. Penguin was released in March 1973 and personnel changes had become epidemic. The album opens strongly with two excellent songs by McVie, C (I particularly like “Dissatisfied”) and one by Bob Welch (“Bright Fire”). Things get a bit uneven after that, though I love the insistent menace of Welch’s “Revelation”, a precursor to “Hypnotised” on the next album. The country twang of “The Derelict” (Dave Walker’s sole song-writing credit) doesn’t do it for me, nor does the cover of “(I’m a) Road Runner”. The limpid instrumental “Caught in the rain” is Bob Weston’s only compositional contribution but it is a lovely album closer. Reflections on relationship traumas within the band were spun into gold four years later but here they’re just rumours, sullen and dispirited. Recorded in July 1974 and released in September, Heroes Are Hard To Find sees the song-writing shared entirely between Christine McVie (four songs) and Bob Welch (the other seven). Weston and Walker have departed, slimming the band to the quartet of Mick Fleetwood, John McVie, Christine McVie and Bob Welch. This was the first album to make it into the US Top 40 and displays a slicker, shinier production. After the catchy yet plaintive opening title track (Christine McVie, eternally searching for her hero) we have some atmospheric studio textures leading into Welch’s echoing, rolling “Coming Home”. There are more effects on “Angel”, both the guitars and some under-stated synth from Christine. “Bermuda Triangle” is lighter shade of “Hypnotised”. Christine’s “Come a little bit closer” does not really benefit from the addition of strings (what song does?). Bob’s “She’s changing me” and “Silver heels” are unremarkable songs about difficulties with women. Is he trying to balance the gender travails of Ms McVie? Who knows, but it is starting to get a bit tedious. A bit of that old mysterioso Welch magic bubbles briefly in “Born enchanter” before things reach a gentle wave-washed “Safe Harbour”. Safe is a good word to describe this album. Maybe that’s why Bob left at the end of 1974, paving the way for the recruitment of Lindsay Buckingham and his partner Stevie Nicks. 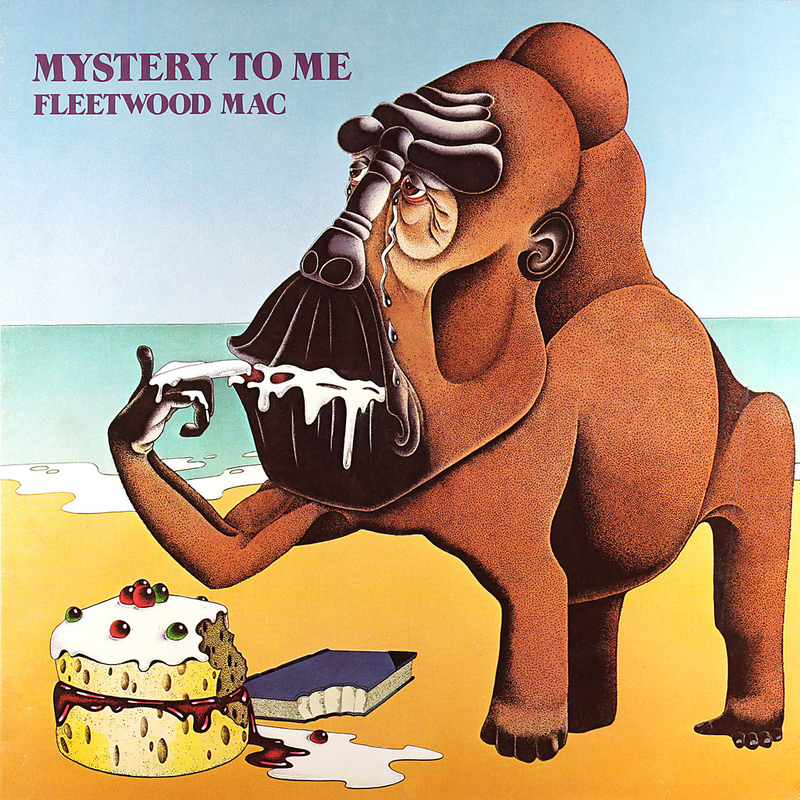 Favourite song: McVie’s title track, “Heroes are hard to find”. 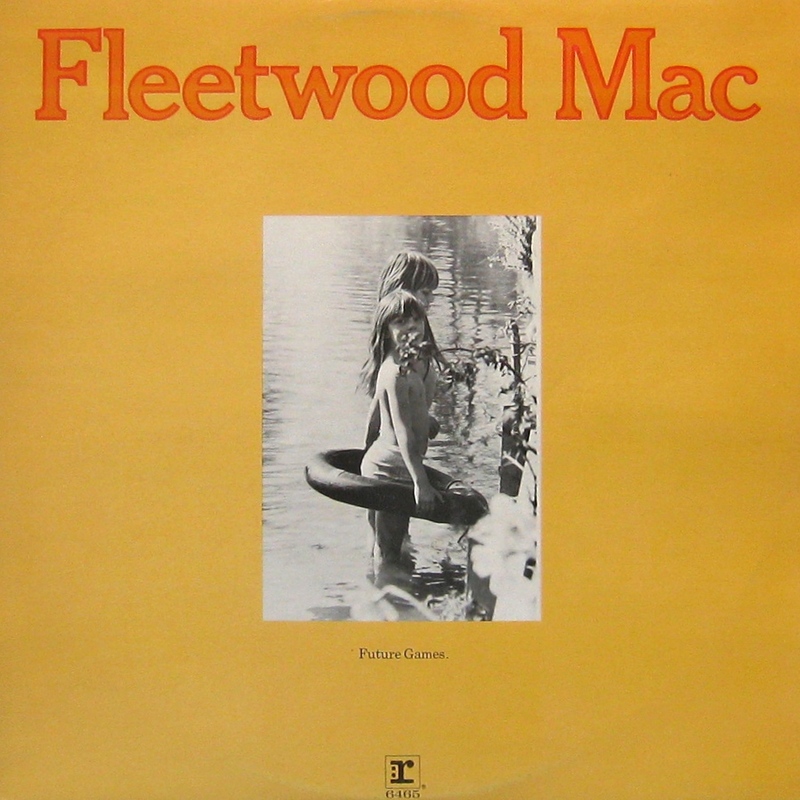 So here we have the Fleetwood Mac albums from 1970 – 1974, as rated by Vinyl Connection. Wow, blowing my small mind over here. I only heard Future Games. The others are completely like new to me. Love the crisp summaries and all of it. So much to learn, you know. RIP, Danny. ‘Crisp’ is a nice word, so thanks! If you enjoyed ‘Future Games’ I’d suggest ‘Bare Trees’ for a bit more DK. Cheers Bill. What a joy to have you revisit this, although obviously too bad about the motivation. The original was one of your most-remembered posts for me; at the time I don’t think I had all of these (and still find myself short one Penguin). Your 2014 posting found me back when I was living a very different, pretty lonely life in Karachi, and put me on a weeks-long Mac-in-the-headphones jag that helped push through the funk. You’ve got me wanting to go back and see what you said unabridged and discover whether I might have surfaced long enough to comment and what I might have said. I’m not sure if our stars would align completely on these, but there’s no doubt that we’d jointly host Bare Trees and Future Games at the top. Thanks, VC. Well, to be transparent, the only abridging that went on was the removal of the long coda about an excellent bootleg (early B-N era). Should put a link in, however. Would love to hear your key tracks (where they vary). I still haven’t scratched the surface of what Fleetwood Mac had to offer in these albums. Shocking. I’ll use this post as a prompt to grab a listen to at least one of them (Future Games). I’ve just been working my way through one of those 5 CD sets you can buy as otherwise these albums are pretty unobtainable. It seems Christine McVie has had a lot of attempts at writing ‘songbird’ before she nailed it on Rumours. As for Danny..I’ll have to post something myself. Great post although I have a softer spot for ‘mystery’ than you and I’m certainly no fan of Bob Welch. As for Kiln House……shocking! Always keen to read another perspective, M58, so look forward to a possible Mac post from yourself. Kiln House is memorable (for me) for that one song that I unaccountable adore: ‘Station Man’. Otherwise, it sure is patchy. A period of Mac that i no very lille of, mostly acquainted with the early “Peter Green’s” and the Buckingham/Nicks late 70’s albums . Interesting though to be pointed in direction of this gap in my education. A pleasure. If you have a listen, hope you find something to enjoy. Like Bill, “Future Games” is the only one of these albums I’ve heard in the entirety – – many times, a favorite late-night driving album. So I’ll get “Bare Trees” as you suggested. I know it’s hardly an original thought, but reading your “epidemic” of staff changes, it does seem like this band should have been named Theseus’s Paradox – where you replace pretty much every component over & over, and wonder if there’s a point in saying it’s the same entity? Thanks for the useful reviews. There is something a bit mythic about Fleetwood Mac – the labyrinthian personnel changes, Stevie Nicks witchiness, Christine Mc as a lonely Aphrodite – and under it all, the Zeus/Poseidon duo of Mick Fleetwood and John McVie. I’d completely forgotten that Bob Welch was once on the roster! I’m unfamiliar with all of these albums–my exposure starting with the eponymously named LP that immediately followed Heroes Are Hard To Find–so will sample your highest rated selection, Future Games. (sings) …A very good place to start. We’ve been down this road before but it’s a good one. Greenpete58 did the same thing on his takes. Re hashed some old ‘Mac’ love. This band (this version and earlier) has a way of staying with a person. I knew Danny had troubles but it always effects me a little when i hear about it. Thanks for posting about this. I saw the news and thought ‘I need to post about that’ but then I didn’t and now I can just point people here! Also: excellent writing about the albums! Thanks Aaron. Lovely guitarist. Been meaning to pull out a solo album of his for a ‘tribute’ listen, but haven’t yet.